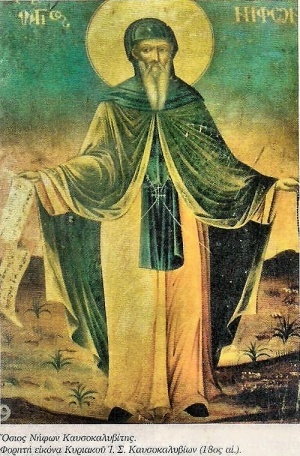 Saint Niphon of Mt. Athos (18th c. icon). Our Venerable and God-bearing Father Niphon Kavsokalybites, also Niphon of Mount Athos ((Greek) Ὅσιος Νήφων ὁ Καυσοκαλυβίτης, 1315–1411) was a hieromonk of Mount Athos in Greece and a proponent of hesychastic theology. His feast day is celebrated by the Orthodox Church on June 14. A Byzantine Greek, Niphon was born in the village of Lukovë, in the Himarra region of the Despotate of Epirus in 1315 AD. His father was a revered priest. From an early age he studied the Holy Scriptures and the Lives of the Saints, and became an erudite polymath. Because he thirsted to learn about the monastic life, he went to the monastery of Geromerion (near the town of Filiates) where he entered into obedience under an ascetic Elder from Sinai. There he learned the canons of becoming a Hesychast, and the way of noetic prayer. Soon after he moved to the nearby monastery of Mesopotamos (in modern Mesopotamos, Delvinë District district) where he was tonsured a monk, and was ordained to the priesthood at the age of twenty. After the repose of his Elder, Niphon went to the monastic state of Mount Athos sometime after 1335, where he dedicated himself to greater asceticism, under the guidance of the monastic Elders, Neilos Erichiotes, Theognostos and Maximos Kavsokalybites ("the Hut-burner," January 13), settling in the cave of the venerable saint Peter the Athonite, close to the Great Lavra (Athos). Niphon was the author of the first biography of Maximos Kavsokalybites, his spiritual advisor. In 1345, Niphon was the Protos of Mount Athos. At that time Athos came under the protection of the Serbian Tsar Stefan Dusan, who accused him for heresy and Bogomilism, but he was successfully defended by Gregory Palamas. In 1347-8 Niphon was tried and deposed from his position as protos after being accused by fellow monks of heresy. He was succeeded by the Serbian monk Antonios. His deposition is regarded as either part of the struggles between rival religious factions that predated the Serbian control of the Athonite community or attempts of Stefan Dusan to gain control of Athos by appointing a Serbian official as its head. This intervention resulted in serious contradictions between the Greek dignitaries and the Serbs of Chilandari monastery on Athos. During 1355-63 he was again accused of heresy when his servant Bardarius revealed before dying that he had joined the Euchite movement, but he was defended by Patriarch Callistus I of Constantinople. It is considered unclear from contemporary accounts whether Niphon was a Euchite or Hesychast at that time. Niphon lived the rest of his life as a Hesychast, dying peacefully at the age of 96 in 1411 AD, glorified by gifts of wonderworking and clairvoyance. A service to St. Niphon exists in the hermitage of Kavsokalybion, where the cave of his asceticism can be located, as well as a small chapel in his honour. (French) Halkin, François. «La vie de Saint Niphon, ermite au Mont Athos, 14e siècle». Société des Bollandistes, 1940. 23 pp. ↑ From Ode 7, of the Canon for All Saints of Athos. ↑ 1.0 1.1 1.2 1.3 1.4 1.5 1.6 Great Synaxaristes: (Greek) Ὁ Ὅσιος Νήφων ὁ Καυσοκαλυβίτης. 14 Ιουνίου. ΜΕΓΑΣ ΣΥΝΑΞΑΡΙΣΤΗΣ. ↑ (Greek) Μωυσή Μοναχού Αγιορείτου. Η ησυχαστική παράδοση στο Άγιον Όρος από τον Άγιο Γρηγόριο Παλαμά έως σήμερα. 23-4-2008. ↑ Kallistos of Diokleia. "St Maximos of Kapsokalyvia and Fourteenth-Century Athonite Hesychasm". In: Kathegetria. Essays Presented to Joan Hussey for her 80th Birthday. Surrey, 1988. p.410. ISBN 978-1-871328-00-4. ↑ 6.0 6.1 Janet Hamilton, Bernard Hamilton, Yuri Stoyanov (Transl.). Christian Dualist Heresies in the Byzantine World, C. 650-c. 1450: Selected Sources. Manchester Medieval Sources Series. Manchester University Press ND, 1998. pp.53. ISBN 978-0-7190-4765-7. ↑ 7.0 7.1 Korac, Dusan. Mount Athos under the rule of Stephen Dusan. Serbian Studies. North American Society for Serbian Studies, 1993. p.81. ↑ Obolensky, Dimitri. The Bogomils: A Study in Balkan Neo-Manichaeism. Cambridge University Press, 2004. p.256. ISBN 978-0-521-60763-6. ↑ OCA - Feasts and Saints. Venerable Niphon of Mt Athos. ↑ (Greek) ΑΓΙΟΡΕΙΤΙΚΕΣ ΜΝΗΜΕΣ. 1417 - Όσιος Νήφων ο Καυσοκαλυβίτης (†1411). This page was last edited on October 24, 2012, at 16:55. This page has been accessed 11,421 times.